Two mainstream websites on Monday appeared to activate push notifications for Safari, a new feature built into Apple's forthcoming OS X 10.9 Mavericks that allows sites to send out updates to Mac users via the Web. First spotted by MacRumors, the NBA.com and The New York Times have apparently activated support for the feature, but have yet to send out any notifications. Other sites are expected to follow suit once Apple officially releases Mavericks to the public, which could come soon, as the company is widely expected to announce the new operating system alongside next-generation iPads at a special event in San Francisco on Tuesday. The Safari push notification service is one of the many new additions Mavericks will bring to OS X. The system works in much the same way as app notifications, such as OS X Mail, which displays a pop-up message box when a new message is received. For the Web-based version, alerts and banners will contain a website's icon, a short text message and clickable hyperlink. Like Notification Center in iOS, users will be able to receive messages even when Safari isn't running. Currently, OS X Mountain Lion only supports app notifications, which are accessible from the Notification Center. 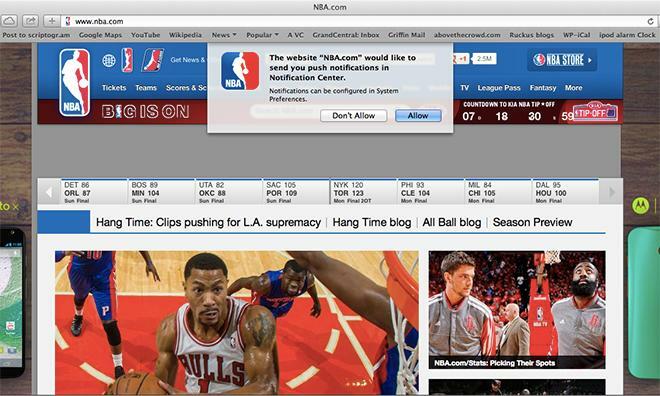 Mavericks will for the first time bring Web-routed notifications to Apple's desktop OS. In early September, Apple sent out emails urging web developers to "get ready" for Safari push notifications ahead of Mavericks' public debut. The company issued the gold master, or finalized version, of Mavericks to devs in early October, suggesting a rollout is close at hand. Apple is expected to announce a firm availability date for OS X 10.9 Mavericks at its iPad event tomorrow, with the new operating system possibly being ready for sale shortly thereafter.